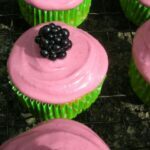 Bramble (or blackberry) and apple is such a classic combination, I thought it ought to be tried in cupcake form. I’ve been wanting to make something along these lines for a long time. At last my blackberry and apple cupcakes have come to fruition. Read on for the recipe. My vision for these blackberry and apple cupcakes was for a bright purple blackberry icing and green cupcake cases to represent the apple part of the sponge. The trouble was, where to find some decent off road blackberries? There seemed to be a sad lack of them around us. Eventually, a trip was made to my mother’s garden where I was not only able to find an abundance of juicy ripe blackberries but also to forage a load of windfall apples. I was purple stained but happy, and my idea was finally able to come to fruition. 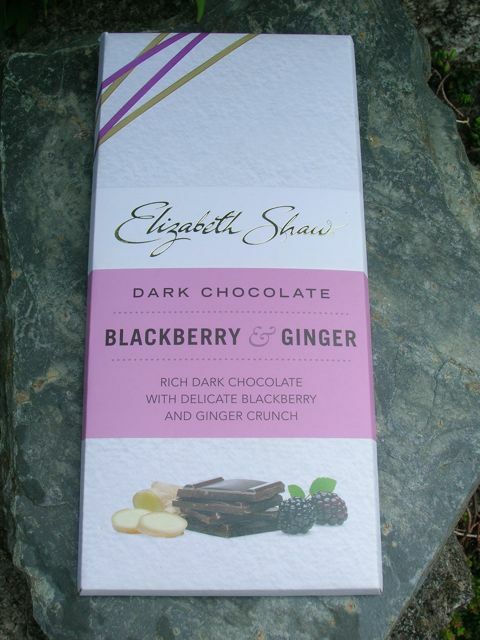 As it happened, I had a bar of blackberry and ginger chocolate sent from Elizabeth Shaw to try. It was just begging to go into the mix. The 57% cocoa solids dark chocolate bar is quite scrumptious in its own right, with an authentic blackberry aroma and flavour. It contains flecks of ginger and blackberry which give a pleasant grainy crunch. Surprisingly, given how prolific blackberries are in the UK, this is the first bar of blackberry flavoured chocolate I’ve ever come across; I found the combination worked very well. These blackberry and apple cupcakes weren’t as visually stunning as I was hoping, but I wasn’t too disappointed either. The blackberry frosting was divine; I very greedily and somewhat naughtily polished off the substantial remains left in the bowl after icing. It tasted of blackberries with a lovely smooth creamy mouth feel. The cakes were also very good, moist and flavoursome. As I’d hoped, the blackberry and ginger chocolate worked particularly well in these bakes. An apple and chocolate chip sponge topped off by blackberry cream cheese icing, these are perfect autumnal fare. The icing makes a generous amount, so use half the quantities if a less lavish topping is required. For something a little less extravagant, you can of course leave out the chocolate. Cream the butter until very light and fluffy. Beat in the eggs (one by one) and vanilla extract if using. Sift in the flour and baking powder and stir in. Add the buttermilk, yogurt or sour milk and stir gently. Add the apple and chocolate pieces and stir gently until just incorporated. Spoon into 12 cupcake cases and bake at 180°C for about 20 minutes or when well risen and golden. Turn out onto a wire rack to cool. Simmer the blackberries in a pan with no added water for a few minutes until juicy. Mash and push through a sieve to extract as much juice as possible. Leave to cool. Cream the 2nd lot of unsalted butter with the icing sugar until very light and fluffy. Briefly beat in the cream cheese until just incorporated. Stir in the cooled blackberry juice until just incorporated, or leave streaky if desired. 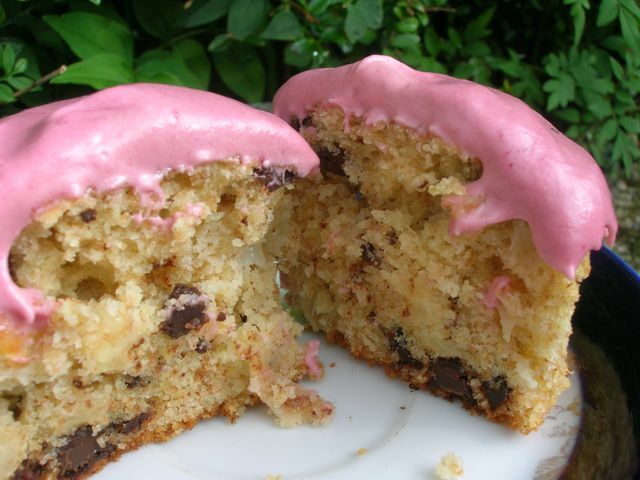 Spread onto the cooled cupcakes and top with a blackberry. Elizabeth over at Elizabeth’s Kitchen Diary has introduced a new food blogging challenge and one that is very close to my heart – Shop Local. Whilst it’s a sad fact that cocoa doesn’t grow in Cornwall, lots of other things do. I’m lucky enough to live in an area where I can buy local eggs from free range chickens and ducks, organic milk from Helsett Farm and also wholemeal flour from Cotehele Mill. All of these were included in my blackberry and apple cupcakes, so I’m happy to be able to partake and help promote some of my local producers. I’m entering this recipe into Four Season’s Food where the theme this month is Sliding into Autumn. It doesn’t get more end of summer, early autumn than a good blackberry and apple bake I reckon. This challenge is hosted by Anneli of Delicieux and Louisa of Chez Foti. Apples are the chosen ingredient for this month’s Feel Good Food from Victoria of A Kick at the Pantry Door, so these cupcakes are winging their way in that direction too. Another challenge hosted by Elizabeth’s Kitchen Diary but created by Turquoise Lemons is the No Waste Food Challenge. Where to start? The blackberries I picked needed using up asap before going off and the windfalls were starting to bruise so they needed using up too. The chocolate has been waiting a very long time for just the right opportunity but was definitely ready for consumption. As the theme for this month’s Calendar Cakes is Cupcakes, I am sending this lot in the direction of Laura Loves Cakes and Dolly Bakes. I’m also adding this to Bake Fest, a monthly celebration of baking from Vardhini of Cooks Joy and hosted this month by Marija of Palachinka Food & Travel. And two years later, I am entering these blackberry and apple cupcakes into The Great British Blackberry Recipe Round Up over at Farmersgirl Kitchen and Lavender and Lovage. Thanks for visiting Tin and Thyme. 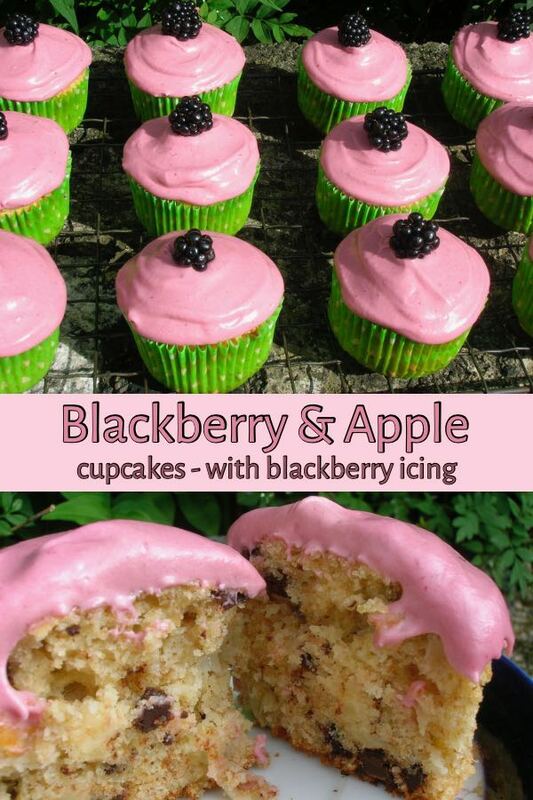 If you make these blackberry and apple cupcakes, I’d love to hear about it in the comments below or via social media. Do share a photo on social media too and use the hashtag #tinandthyme, so I can spot it. For more delicious and nutritious recipes, follow me on Twitter, Facebook, Instagram or Pinterest. 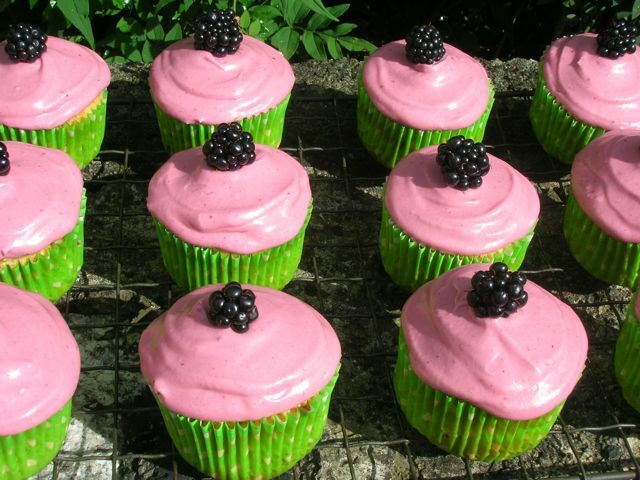 Blackberry & Apple Cupcakes. PIN IT. Fabulous flavours, fabulous presentation and fabulous colour to that blackberry icing. These cupcakes look so adorable, Choclette. I have never tried the combo of blackberry and apple..and I love the idea. Thank you Angie, the combination is a British classic at this time of year. Blackberry and apple crumble is pudding that abounds at this time of year and I have just made blackberry and apple jelly. The icing looks really gorgeous and I immediately would like to eat one of those cupcakes. The last time I saw blackberries in an overabundant way was along the South West Coastal path. A lady was there picking some with her son in law. The coast path is often a good place to gather them Chris. This year they have been fantastic, really big and juicy, but it’s not always easy to find good off road places to pick them. I’ve just made blackberry and apple jelly, so I feel I’ve managed a decent harvest. What a beautiful, delicious sounding cupcake! Blackberry and apple are a fantastic combination and just look at the colour of that icing! Stunning! Thank you for sharing your recipe with Shop Local and the No Waste Food Challenge! I’ve never seen them quite as prolific and large as this year and they seem to taste better too. Crumble sounds fab Nat. I ended up using mine to make blackberry and apple jelly. If I’ve got time to go out gathering more, I think a crumble will need to be made. oh my god WHAT!! !… they look amazing!… were they a little tart? I love the tartness of blackberries that work so well with apples.. these do look heavenly… we have SO many blackberries around us this year, you’re welcome to come up and forage near me! Thank you Dom 🙂 Tart fruit works brilliantly in baking I reckon, but these blackberries were mostly sweet and juicy. I disagree, I think they look VERY visually attractive Choclette! The icing in particular sounds absolutely delicious. Oh thank you Jo, that’s very kind of you and much appreciated. Always good to have second opinions. Wow! These look so sweet! Love the color & so inviting! YUMMY! I think they look very good indeed. I love the shocking pink and no food colouring needed. They are a very good idea. Again, I wish I could reach into the screen and grab one. I went blackberry picking over the weekend. I love your beautiful cupcakes with fresh and seasonal fruit. And the colours are amazing! Ciao! Thank you Alida – looking forward to finding out what you do with your blackberries. Thanks Anneli – these were good, but the icing was the best part. You are well ahead of me Laura, these are the first blackberries I’ve picked this year – apart from those munched on when out walking, but that doesn’t count. What a gorgeous colour (and flavour) combination and not a hint of artificial colouring in site. I need to get out and find some blackberries!! Thanks Angela. I love my vibrant colours, but prefer them to be natural ones. Thank you very much. I love vibrant colours, but it’s very rare that I use artificial colourings. I am bookmarking these. Just need to forage for some more blackberries. I tried but failed to leave a comment on these before so had to come back and find them! These are such pretty cakes, I just love the icing colour, I hate using food colouring so these really appeal to me, they sound wonderful. I love the blackberry apple flavour combination too! I’m with you Jayne, it’s a very rare event for me to use food colourings. Sorry about your trouble with comments. Capcha is very annoying and is always catching me out when commenting on other’s blogs – grrrr. So pretty to look at. A taste combination I had not considered before.